Love reading that someone I look up to also started like I did with conferring. So many times you feel like you are the only one having trouble. 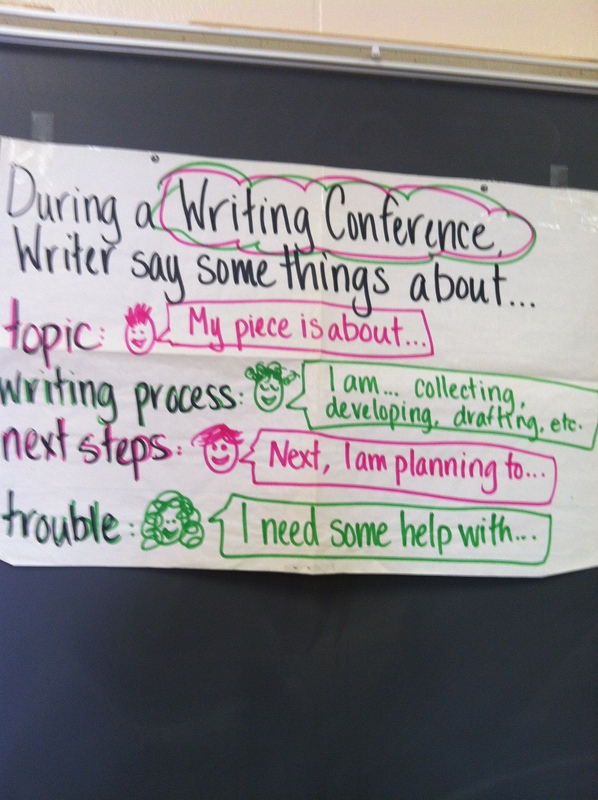 Teaching kids how to talk about their writing is so key, thanks for reminder and wonderful prompts. It actually makes me excited to go back to school and focus on this. You are seventeen kinds of lovely, Kathy. I love that this post made you excited to go back to school. You can absolutely do something similar with your readers as well. What I am really thinking about, however, is that oh-so-common feeling of “I’m the only one who’s having trouble with…” I definitely want to write about that! Thanks for feeding my writing life with a powerful idea. Shana, it is such a beautiful thing to be able to read you and hear your voice in my head! I laughed about the laps – as I’m sure many of us have – because we’ve done them too! Conferring can be scary business. Topic, Process, Next Steps, Trouble: This post gives such an approachable way to give it a try, helping our students know how to engage in conversation about how “its going”. You have given teachers such a simple yet powerful way to engage in conferences that feel like a collaborative conversation between writers. Love it! i love this so much, and am excited to use it to revise my mini-lesson and artifact to hand my kids on what they might do during a conference. anything peter johnston makes me excited, and i love this concrete way to help normalize trouble. thank you! My pleasure, taraandkate. Thanks for consistently supporting the blog. Writers write to be read and it’s lovely when one’s audience gives feedback!